You’ll see us mingling about town and impacting the communities we live & work in – we hope YOU will join us too! We visit a different venue normally on the 3rd Tuesday of each month from 5-7pm. HOWEVER, due to the Thanksgiving holiday, we moved this event up 1 week and will be gathering on the 2nd Tuesday, Nov. 13th from 5-7pm in this super cool venue! 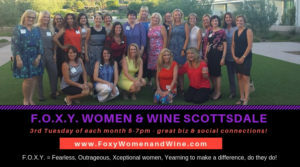 Your tickets include; the opportunity to connect with a fabulous community of women & a chance at several great door prizes. Food and/or drink is not included in your ticket price however you may order directly from the restaurant! This month we are excited to visit Hotel Adeline! Hotel Adeline is a super chic new boutique hotel in Scottsdale! You will love it and your love the connections you make here even more! We hope you will join us!